DENVER — As expected Matthew Stafford (ankle) is the starter today against the Broncos. He was listed as questionable on Friday’s injury report. DT Nick Fairley (foot) and WR Rashied Davis (foot) are both inactive and were both doubtful. 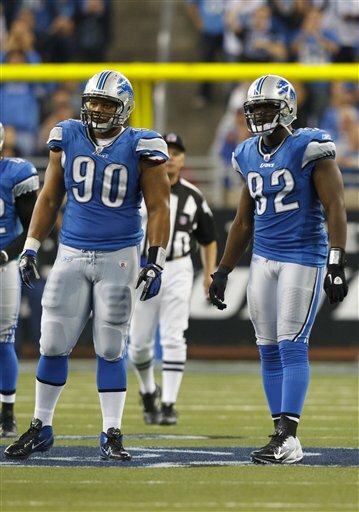 The Lions won’t be too short-handed on the defensive line because DT Sammie Hill (ankle) is active. He was questionable, along with Stafford. Running back Jahvid Best (concussion) was declared out on Friday. It’s the second game he missed after suffering the concussion against the Falcons. Maurice Morris will start for the second straight week. Also inactive is newcomer safety Chris Harris who was claimed off waivers on Friday, along with CB Don Carey, Jason Fox and Drew Stanton. DENVER — Ndamukong Suh will take one of his off days during the bye week to meet with NFL commissioner Roger Goodell and others to discuss his penalties and fines according a Fox Sports report by Jay Glazer. The meeting was requested to also clarify what is and is not considered a penalty. It was initiated by the Lions second-year defensive tackle according to Glazer and is expected to take place this week. The Lions have a bye on Sunday, Nov. 6. Suh, the defensive rookie of the year last year, has gained a reputation as a dirty player. The Sunday Denver Post put him at No. 1 on the Active All-Dirty Player list. He got a 15-yard facemask penalty last week but was not fined. 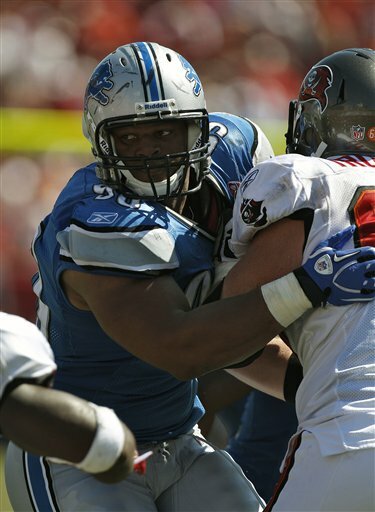 Suh has repeatedly said he will not back off, he’ll keep playing aggressive football. 1. Offensively get off to a quicker start. They have been able to dig themselves out of large deficits (Minnesota, Dallas) but they’ve been on the short end the last two Sundays. The defenses they see when they take the field are not the defenses they’ve seen on film. The offense must adjust more quickly to the changes. 2. The defense must prevent the long runs. It doesn’t matter if the defense stops the run 90 percent of the time, they cannot allow the occasional bursts for 40 or 50 yards. Just can’t. 3. Rattle quarterback Tim Tebow early and often. He’s not experienced, perhaps a face full of Ndamukong Suh and Corey Williams would shake him up, especially early. Also stop him on the run. 4. Special teams must step up, especially the coverage units. Field position will be key for the Broncos so no long returns should be tolerated. 5. It’s not all about the attitude, but it’s important. Go hungry, play full-out on every snap. Prove that something’s been learned during the last two losses. Prediction: Lions 24, Broncos 10. ALLEN PARK — Lions quarterback Matthew Stafford, who injured his ankle Sunday, was back at practice for the second straight day. Today (Thursday) he did drills with the starters. Wednesday it was Shaun Hill working with starters. Stafford doesn’t appear to be limping. If he keeps improving expect him to start Sunday at Denver. Missing from practice were: Jahvid Best (concussion), LG Rob Sims (unknown), DT Nick Fairley (foot), DT Sammie Hill (ankle) and WR RT Rashied Davis (foot). Back at it today after missing on Wednesday were CB Chris Houston (back) and Gosder Cherilus (knee). ALLEN PARK — Matthew Stafford was at practice today (Wednesday) wearing a helmet which is usually a sign that an injury is not too significant. The quarterback, who injured his right ankle in Sunday’s loss to the Falcons, jogged lightly and threw a few balls, but obviously was limited. He was walking stiffly. At one point a trainer brought out a different shoe for his right foot. Quarterback Shaun Hill worked some of the early drills with the starters while the media was present. Running back Jahvid Best (concussion) was not at practice. He did not play on Sunday. Cornerback Chris Houston (back) and DT Sammie Hill, who both went down in Sunday’s game, also did not practice. Defensive end Kyle Vanden Bosch didn’t practice, but he generally has Wednesday as a rest day. Defensive end Willie Young, who sat out Sunday with a calf injury, was back at practice. The Lions (5-2) play at Denver (2-4) on Sunday. Oddly enough, on Wednesday the Lions practiced outdoors to prepare for Denver, while the Broncos moved practice indoors because of snow. ALLEN PARK — Lions quarterback Matthew Stafford left Ford Field wearing an orthopedic boot after Sunday’s loss to Atlanta. But his ankle injury is not serious according to coach Jim Schwartz. In his Monday presser Schwartz said Stafford is day to day, nothing more. Following the game his ankle and knee were a concern, but the knee is not an issue per Schwartz. Stafford didn’t address the media on Monday, but Ndamukong Suh did and he had plenty to say about accusations that he and Cliff Avril taunted or kicked quarterback Matt Ryan when he was down. Stay tuned, writing as fast as I can. Five things we learned from Lions’ 23-16 loss to Atlanta on Sunday. 1. Matthew Stafford must get better protection. He was sacked three times, it only seemed like more. After the loss to the 49ers the offensive line knew they had to step up. Sacks are not all the fault of the offensive line, but they have to step up and give Stafford time. 2. The defense is having trouble stopping the run. It’s grand they hold opponents to about 2 yards per gain until they blast through for the big run. Unacceptable. 3. Maurice Morris and Keiland Williams combined for 94 rushing yards. No word on if Jahvid Best will be back from his concussion on Sunday. 4. For all the talk, the defensive line needs to get more pressure on opposing quarterbacks. They had four sacks on Sunday, but they need more pressure. Also they need to play clean. Touch a facemask and a guy in a striped shirt will see it. Just saying. 5. The Falcons are whining that Ndamukong Suh and Cliff Avril were taunting Matt Ryan when he was down. Good for them. This is the NFL, no room for sissies. DETROIT — Only surprise for the Lions is that DE Willie Young is out. Young has had a sack in two of last three games. He was limited at practice on Friday with a calf injury. Perhaps the big news today is that Falcons’ RB Julio Jones is out with a hamstring injury. He was doubtful for the game. Harry Douglas will get the start at running back. Lions running back Jahvid Best (concussion) was listed as out on Friday’s injury report. WR Rashied Davis (foot) and safety Vincent Fuller (elbow) were listed as doubtful and are inactive. Also out are Drew Stanton, Joe Jon Finley, Jason Fox and Rashied Davis. Along with Jones, other Falcons who are inactive are Chris Owens, Darrin Walls, Brett Romberg, Sam Baker, Carlton Powell and Cliff Matthews. 1. Establish a run game with Maurice Morris as the starter with Jahvid Best out with a concussion. Morris hasn’t had much work this season (he had a broken hand in camp), but he was solid in 2010 and came through big-time with 109 yards in the overtime win at Tampa. He had a touchdown in each of the final three games last season. 2. The offensive line had a bad game against a good 49ers defense. Matthew Stafford was sacked five times and pressured early and often. The line must get back on track, give Stafford time and protection. 3. Improve success in the red zone. 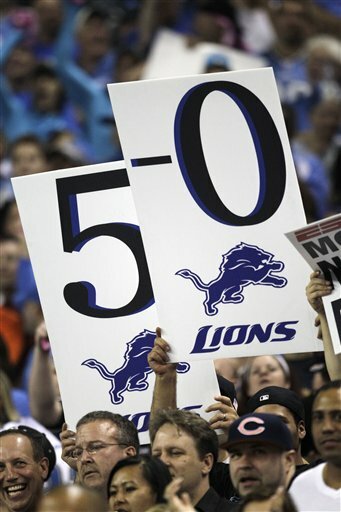 Last week the Lions had to settle for a pair of field goals because they couldn’t score touchdowns from inside the 20. That cost them the game. 4. 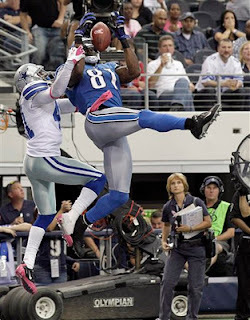 Like every week, get the ball to Calvin Johnson. While he had seven catches for 113 yards last week, San Francisco’s double-bracket defense kept him from scoring. You know the Falcons had an eye on that defensive strategy. ALLEN PARK — Again this week expect rookie defensive tackle Nick Fairley to play, but not to start. It’s going to take some time. Defensive coordinator Gunther Cunningham was asked on Friday if he’s ever going to change the defensive line’s aggressive, attack strategy and he brought up Fairley. Fairley was jogging on the indoor practice field from sideline to sideline with an assistant following Friday’s practice. He missed most of camp and the beginning of the season after he broke his foot early in training camp. He’s played sparingly the last two games. ALLEN PARK — Running back Jahvid Best, who has a concussion, did not practice again today (Friday). It’s highly unlikely he’ll play Sunday against the Falcons. Eldra Buckley, the Lions’ new running back, was at practice and wearing No. 35. Buckley, who worked out for the Lions on Thursday, was cut by Philadelphia as part of the final roster cuts on Sept. 3. RB Jerome Harrison, who has a brain tumor, was placed on reserve/non-football illness list. Also missing from practice were CB Eric Wright, who practiced on Thursday, and WR Rashied Davis (foot) who didn’t practice Thursday. ALLEN PARK — The Lions signed free agent running back Eldra Buckley (Tennessee Chattanooga) today after they placed Jerome Harrison on Reserve/Non-Football Illness List. Buckley was cut by Philadelphia as part of the final roster cuts on Sept. 3. He spent 2009 with the Eagles. Originally signed as an undrafted free agent by San Diego in 2007 and spent two seasons on the Eagles’ practice squad. Heading out to practice to see if he’s there. ALLEN PARK — Lions running back Jahvid Best, who on Sunday suffered his second concussion in three months, didn’t practice on Thursday. There is talk he may be done for the season. Best has a concussion history going back to Cal where he missed the final four games of his senior season with a severe concussion. His concussion history was a red flag when he was drafted by the Lions in the first round in 2010, but they said they had done their due dilligence through testing. ALLEN PARK — Surprisingly tight end Tony Scheffler and linebacker Justin Durant were at practice today (Thursday). They were doing individual drills in the part that was open to the media. Durant, who has missed three games, said on Wednesday he had passed his concussion tests, but he just did exertion work on Wednesday instead of practice. Scheffler was injured in the Monday night game and didn’t play against the 49ers. Jahvid Best, who suffered a concussion on Sunday, was not at practice. Also not at practice was running back Jerome Harrison who failed a physical by the Eagles which nullified the trade that would have sent Ronnie Brown to Detroit. Wide receiver Rashied Davis (foot) and S Vincent Fuller (elbow) did not practice. In practice squad moves the Lions brought back fullback Matt Clapp and put James Davis on practice squad injured list. Davis had practiced one day with the Lions before getting injured. ALLEN PARK — So the NFL issued a statement on Wednesday admitting that they gave the 49ers a 5-yard advantage on Sunday’s game-winning drive with a bad spot of the ball. Five yards is a lot, but Lions coach Jim Schwartz isn’t using it as an excuse. “It’s an unfortunate thing. They do their very best obviously sometimes things happen. The thing that made that difficult on that play there was also another situation we were talking to the officials about on that play, it went unnoticed coming out of that time-out,’’ Schwartz said. He was talking about an illegal block on Maurice Stovall that was not called. When asked if he had somebody to watch the spots, he had a two-word reply: The officials. ALLEN PARK — Nine Lions including six starters didn’t practice today (Wednesday). The list: S Amari Spievey (hamstring), DE Kyle Vanden Bosch (stinger on Sunday but usually rests on Wednesdays), CB Chris Houston (not sure of injury but no obvious cast or boot), LB Justin Durant (concussion), TE Tony Scheffler (concussion), RB Jahvid Best (concussion), S Vincent Fuller (elbow), CB Aaron Berry (groin) and Rashied Davis who has his foot back in a orthopedic boot. Also, RB Ronnie Davis, who was dealt to Detroit from the Eagles on Tuesday for Jerome Harrison and a pick, was not at practice in the portion seen by the local media. In practice squad news, RB James Davis (Clemson) was signed and TE Nathan Overbay was released. Did officials give 49ers an advantage on the game-winning drive? Looking back on it, the officiating may have cost the Lions a win on Sunday. Not only were there bad calls including a horse-collar call on Chris Houston when he had just grabbed a little jersey, but also a bad chop block call on Brandon Pettigrew and the safety on Matthew Stafford that was questionable. Now, according to a report on ProFootballTalk,com, the officials gave the 49ers an extra five yards on the game-winning drive when they spotted the ball in the wrong place. With the Lions leading 19-14, they punted from their own 36-yard line with five-plus minutes left in the game. Ted Ginn fielded the punt, and crossed midfield before getting pushed out at the Lions’ 40 by punter Ryan Donahue. The ball was spotted at Detroit’s 35, giving the 49ers a 5-yard advantage, per the PFT report. Just watched the replay over and over. The TV announcers called Ginn out at the 36, but it looked closer to the 38 to me. Didn’t have a good view and he could have had a foot out at the 40. Definitely the ball was spotted at the 35 for the 49ers to begin their drive which resulted in a fourth-down, 6-yard touchdown pass. So San Francisco got at least a 1-yard advantage maybe 5. The Lions didn’t notice the bad spot and neither did anyone else. Perhaps they were too upset with all the missed tackles on the punt. (I counted four.) The skirmish at the end between Jim Schwartz and Jim Harbaugh seemed to overshadow everything. San Francisco was called for 15 penalties in the game including five for false starts due to the crowd noise. They were belly-aching about the officiating following the game. Detroit was whistled for six. But maybe it’s the Lions that were hurt the most. 1. The defense has much room for improvement especially against the run. 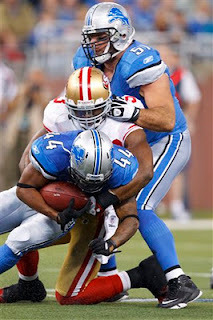 What was most surprising was the 49ers kept running it up the gut, and still the Lions couldn’t stop them. They’ve played the last three games without linebacker Justin Durant, who has a concussion, and they’ve gotten by until Sunday. In fact, Bobby Carpenter has done a good job in his place. It’s a head scratcher. 2. In the first five games the offensive line had protected Matthew Stafford pretty well except when he was sacked five times in Minnesota. He barely got touched Monday night against the Bears. Well he got sacked five times by the 49ers and hit 10 times. All sacks are not on the line, but they take pride in keeping him upright and they just didn’t do a good job. They can play better. 3. Jahvid Best can run the ball, but the Lions can’t seem to put together a good running attack week after week. Give the 49ers defense credit but they aren’t the only team that has stuffed the Lions’ rushing attack (I use that word loosely). 4. All three phases — offense, defense and special teams played poorly. Sometimes one unit can help bail out the others, but not when they’re all out of sync. Give the Lions credit, they would not use the short week (they played Monday night) as an excuse. However, it could have been a factor. 5. The feeling in the locker room was that the 49ers should have been happy, they beat a great team. This is a position the Lions haven’t found themselves in for years — it’s a big deal to other teams when they beat Detroit. Now they have to adjust to having that big bull’s-eye on their backs. DETROIT — No surprises among the Lions’ inactives for Sunday’s game vs. the San Francisco 49ers. DT Andre Fluellen, who played in the first 5 games, is out as a coach’s decision. That leaves 8 active defensive linemen including rookie DT Nick Fairley who made his debut on Monday night. Safety Amari Spievey (hamstring), CB Aaron Berry (groin) and WR Rashied Davis (foot) are active after being listed as questionable on Friday’s injury report. LB Justin Durant and TE Tony Scheffler, who both have concussions, were ruled out on Friday along with safety Vincent Fuller (elbow). Will Heller will start in place of Scheffler, while Bobby Carpenter will get third straight start at linebacker for Durant. Out for the 49ers are: Scott Tolzien, Braylon Edwards, Tramaine Brock, Moran Norris, Daniel Kilgore, Mike Person and Parys Haralson. Here are five things the Lions (5-0) must do to beat the San Francisco 49ers (4-1) at Ford Field on Sunday. Kickoff 1 p.m.
1. 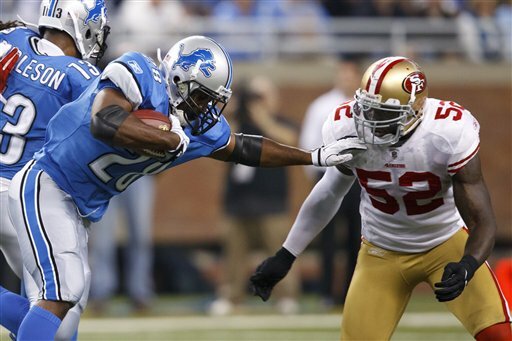 The Lions must stop the 49ers ‘ running game, force them to pass making them one-dimensional. Detroit’s defense against the run is ranked 12th in the NFL and rising. 2. Matthew Stafford’s uniform barely got dirty in the win over the Bears. He needs to continue to have time to look downfield and find you-know-who. 3. Jahvid Best’s breakthrough 88-yard touchdown run was exceptional, he also had a 43-yard scamper in the best running game of his short career (163 yards on 12 carries). The Lions need to look at what happened and create the same holes again. 4. Get the ball to Calvin Johnson. He only had one touchdown last week, but along with that he had four other catches and averaged 26 yards per catch. 5. On Monday night, Nate Burleson ran out of the smoke-filled tunnel with boxing gloves draped around his neck in homage to Michael Buffer who was announcing the players. Perhaps he should wear them again Sunday to remind his teammates to keep fighting. They need to maintain that hungry attitude and I expect they will. As expected linebacker Justin Durant and tight end Tony Scheffler are out for Sunday’s game against the San Francisco 49ers. Both have concussions. This will be the third straight game that Durant misses. He was leading the team in tackles when he went down in Minnesota. Scheffler was injured on Monday night and couldn’t finish the game. Neither one was cleared to practice all week. Also out will be safety Vincent Fuller who injured his elbow on Monday night in his first game with the Lions. That leaves Detroit thin at safety. Amari Spievey (hamstring) is questionable but expected to play. Louis Delmas and John Wendling are the only other healthy safeties. CB Aaron Berry (groin), WR Rashied Davis (foot) and T Jason Fox (foot) are also listed as questionable. For San Francisco, cornerback Tramaine Brock (hand), wide receiver Braylon Edwards (knee) and running back Moran Norris (fibula) are out. ALLEN PARK — Neither LB Justin Durant or TE Tony Scheffler practiced today (Thursday). Both have concussions. Scheffler suffered his in Monday night’s game and could not finish. No word on if it’s a long-term situation with him, but the Lions signed TE Joe Jon Finley who was at practice. Finley, who was on the Lions’ practice squad last season, was cut on Sept. 3. Durant suffered his concussion against the Vikings. He practiced on a limited basis at the end of last week but didn’t see action on Monday night because concussion symptoms returned in the pre-game warm-ups. Safety Amari Spievey, who sat out Monday with a hamstring, was on the practice field for the part of practice that the media is allowed to watch. Also returning to practice were CB Aaron Berry and WR Rashied Davis. Earlier today it was announced that S Erik Coleman has been placed on Injured Reserve, ending his season. Last week the Lions signed veteran safety Vincent Fuller. With Spievey and Coleman out on Monday, Fuller saw game action. They have four safeties with Fuller and another, Ricardo Silva, on the practice squad. ALLEN PARK — Safety is a position of concern with the announcement this morning that Erik Coleman (ankle) has been placed on Injured Reserve list, ending his season. He was injured in the game at Dallas and missed the Monday night game along with starting safety Amari Spievey (hamstring). It’s a move the Lions may have seen coming because they signed S Vincent Fuller last week. Even though he didn’t have much practice time with Detroit, he saw action on Monday night. Spievey could be back Sunday to face the 49ers. Although the Lions didn’t practice Wednesday he was listed on the injury report that speculated he would have been limited in practice. Signing Finley may mean that tight end Tony Scheffler, who suffered a concussion on Monday night, may have a long-term injury. ALLEN PARK — How much help were the fans on Monday night in helping the Lions beat the Bears? Enough that coach Jim Schwartz is awarding the fans a game ball from the Monday Night Football game. It will be painted up with the details and displayed at Ford Field. “(The fans) did a heckuva job. 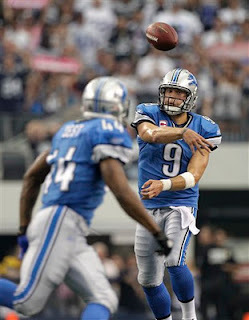 That kind of atmosphere is something we need week in and week out,’’ quarterback Matthew Stafford said on Wednesday. “They did a great job being quiet on offense and loud on defense which we appreciated, it’s going to be a ton of fun,’’ he added. Sounds a little strange, but Lions fans had forgotten their Ps and Qs over the long stretch of mediocrity. At times last season they were loud when the Lions’ offense was on the field. The Lions (5-0) host the 49ers (4-1) on Sunday in a key NFC contest. San Francisco’s only loss came to Dallas in overtime. The Lions are 5-point favorites. DETROIT — Perhaps the Detroit Lions should get used to the spotlight. All eyes were on Ford Field on Monday night for the Lions 24-13 win over the Chicago Bears in the nationally televised divisional game. On Sunday, again the Lions (5-0) will be involved in perhaps the biggest NFL game of the day when they host the San Francisco 49ers (4-1). The 49ers, under new head coach Jim Harbaugh (yes, that Jim Harbaugh) have been the surprise coming out of the NFC West. With a new head coach, coordinators and several key players it was thought the 49ers, who finished last season 6-10, might be a team to struggle out of the gate due to the lack of offseason training because of the NFL lockout. But they have surprised most everyone including the Tampa Bay Bucs who they embarrassed 48-3 on Sunday. The Lions, who have played San Francisco just once at Ford Field, have not beaten the 49ers since Sept. 25, 1995. Quarterback Alex Smith has also been a surprise this season. He’s completed 83 of 126 attempts for 965 yards, seven touchdowns and just one interception. In his seventh NFL season, Smith also rushed for another score. Against the Lions, he will be without his top wide receiver Joshua Morgan. Late in Sunday’s game Morgan sustained a broken bone in his lower right leg. It was announced on Monday that he will required surgery and will miss significant time. The game against the 49ers will be the second of three straight home games for the Lions. They will host the Atlanta Falcons (2-3) on Oct. 23 before heading to Denver (1-4) on Oct. 30 for their final game prior to the bye week. Take a deep breath after the Lions 24-13 win over the Chicago Bears on Monday night. Now please help us out with a special project. How far will the Lions go this year? How long have you been a fan? Leave your message of support for the Detroit Lions by calling 248-291-7332. Your response is sought for a special multi-media report on the Lions. Please remember to leave your full name and the community you reside in. DETROIT — Nick Fairley will see his first NFL action tonight against the Chicago Bears. Fairley, the Lions’ first-round draft pick, had been sidelined since early in training camp while rehabbing a broken foot. He practiced four days last week but he said on Saturday he had not been told if he would or would not play. He was listed as questionable on Saturday’s injury report. According to the depth chart, Fairley will not start. Expect him to rotate in and out of the defensive line with Corey Williams, Sammie Hill and Andre Fluellen. Also inactive is Justin Durant who had concussion symptoms during pregame warm-ups. He missed last week’s game with a concussion but had practiced last week. S Amari Spievey (hamstring) is also out. John Wendling will start in his place. On Saturday S Erik Coleman (ankle), WR Rashied Davis (foot) and T Jason Fox (foot) were listed as out. Also out are RB Jerome Harrison and Drew Stanton. Inactives for Chicago are: Nathan Enderle, Kahlil Bell, Gabe Carimi, Earl Bennett, Stephen Paea, Mario Addison and Corey Wootton. 1. Protect Matthew Stafford. The Bears’ front seven, which includes Julius Peppers, is dangerous. In three of the first four games Stafford has not been sacked. It’d be a good idea to keep him clean in this one too. Just saying. 2. Stop Matt Forte, a multidimensional threat on the run and as the recipient of short screen passes. He had 205 yards last week. If can equal that, the Lions lessen their chances of picking up their fifth win in five games. 4. Get the ball to Calvin Johnson. He’ll be double- and triple-teamed, but if Stafford can connect with him for another pair of touchdowns, it could be a happy night at Ford Field. 5. Stay focused. It’ll be a grand homecoming for the Lions who have played just once at Ford Field in the first four games. The crowd will surely thank them for the 4-0 start. It’s all good, it’s all fun. But once the ball is snapped, focus is key. ALLEN PARK — Only two Lions couldn’t practice Saturday. Safety Erik Coleman (ankle) and wide receiver Rashied Davis (foot) were both out. Offensive lineman Jason Fox (foot) practiced for second straight day. All three were listed as out on the injury report for Monday night’s game. Justin Durant (concussion) and Nick Fairley (foot) were upgraded to full practice Saturday. Durant is probable for Monday while Fairley is questionable. Others on the injury report: Aaron Berry (groin), Lawrence Jackson (hamstring) and Amari Spievey (hamstring) are questionable; Louis Delmas (abdomen), Calvin Johnson (ankle), DeAndre Levy (knee), Maurice Stovall (hand) and Eric Wright (groin) are probable. ALLEN PARK — Nick Fairley has still not gotten the word if he will make his NFL debut on Monday Night Football. The Lions’ first-round pick did practice on Saturday for the fourth straight day. Defensive end Kyle Vanden Bosch said he thinks Fairley will play, but he has no idea what the coaches are thinking. Defensive coordinator Gunther Cunningham sang Fairley’s praises after Saturday’s practice. “We had a two-minute drill and I looked out there and said, ‘That’s the way life is supposed to be Gunther.’ I’ve had a history of having some really outstanding defensive linemen in my career, when I looked out there, I’m still alive I’m sure, sometimes you dream about those things,’’ Cunningham said. 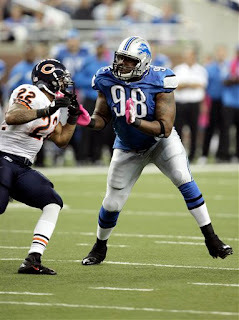 Fairley was lined up at the time with Ndamukong Suh, Kyle Vanden Bosch and Cliff Avril. The decision on whether he will play is not up to Cunningham. “The decision has yet to be made. It’s in Jim (Schwartz’s) hands and the trainer, but I do have a lot of political maneuvering,’’ Cunningham said. Fairley broke his foot early in training camp and this was his first full week of practice. ALLEN PARK — Only two Lions couldn’t practice today (Saturday). Safety Erik Coleman and wide receiver Rashied Davis were both out with foot injuries. Rookie defensive tackle Nick Fairley was participating fully in the portion of practice open to the media. He has had limited practice the past two days according to the Lions’ injury report. He said on Friday he had not been told if he will make his NFL debut on Monday. Fairley broke his foot early in training camp. This was his first full week of practice. Offensive lineman Jason Fox practiced for second straight day. It’s likely it was on a limited basis. He is not expected to play on Monday. In practice squad moves, G Jacques McClendon was signed. He had been cut from the Lions’ 53-man roster earlier in the week. WR Owen Spencer was cut to make room. ALLEN PARK — Who is more impatient? Lions fans to see their first-round pick Nick Fairley take the field, or Fairley himself. He has not heard from the coaches and trainers whether he will play on Monday night against the Chicago Bears. The rookie defensive tackle broke his foot early in training camp. He practiced on Friday for the third straight day and just the fourth time since the injury. “I’ve been getting better each and every day. Basically every day I’ve been taking a step forward. Everything’s been going good, they’ve been tremendous through the whole process of getting me back to where I need to be,’’ Fairley said. ESPN has reported that he will play, but coach Jim Schwartz will not confirm or deny the report. Fairley said we’ll know when he get the OK, because he’ll be all smiles. “Whatever coach Schwartz and the trainers come up with I have to go with. It’s not up to me, whenever they give me the green light I’ll be ready to go full-steam ahead,’’ Fairley said. He'll have to work his way up the depth chart. Ndamukong Suh and Corey Williams start at defensive tackle while Sammie Hill and Andre Fluellen rotate in and out. ALLEN PARK — Jason Fox was on the practice field today (Friday) with a helmet for the first time since breaking his foot early in training camp. But the offensive lineman didn’t do much other than stretch and watch the other offensive linemen slam into the sled during drills. Nick Fairley was back at it for a third day. But from the part of practice that the media is allowed to see, it was unclear if the first-round pick was at full go. He had to take a break during drills to have his foot re-wrapped. He practiced on Thursday on a limited basis. While ESPN has reported Fairley will play on Monday night, that is not a certainty at all. He’s going to need a few full practices to start to get up to speed. Saturday is the only practice day left before Monday night’s game against the Bears. Safety Erik Coleman (foot) and wide receiver Rashied Davis (foot) remained out on friday. 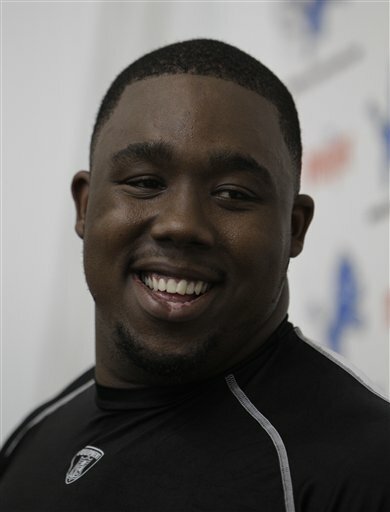 ALLEN PARK — First-round pick Nick Fairley returned to practice for second straight day today (Thursday). It’s the first back-to-back practices for the defensive tackle since he broke his foot early in training camp. This does not necessarily mean that he will play in the Monday night game against the Bears, but it’s a step in the right direction. 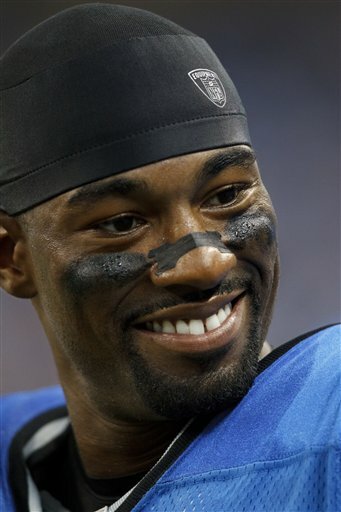 Calvin Johnson, Titus Young and Stephen Tulloch all returned to practice after sitting out on Wednesday. Still out are Amari Spievey, Erik Coleman, Rashied Davis and Jason Fox. 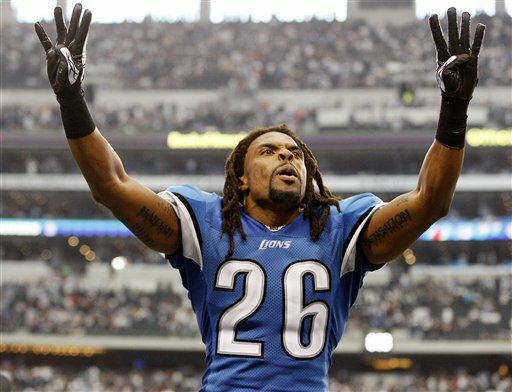 The Lions signed S Vince Fuller who played for Jim Schwartz with the Tennessee Titans. To make room on the roster they cut G Jacques McClendon. Standing room only tickets for Monday night’s game go on sale at 1 p.m. today at Ticketmaster.com and DetroitLions.com. Tickets are $50 with a limit of four per person. ALLEN PARK — Eight Lions were missing from practice this afternoon including starters Calvin Johnson, Justin Durant (concussion), Stephen Tulloch and Amari Spievey. 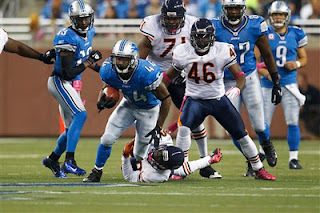 Also out were Titus Young, Rashied Davis (foot), Erik Coleman (leg) and Jason Fox (foot). Rookie Nick Fairley practiced for the first time since Sept. 29. That day was his only practice since he broke his foot early in training camp. That does not mean he will play on Monday, but it’s an encouraging sign. Wednesday’s practice was a bonus day for the Lions (4-0) who will host the Chicago Bears (2-2) on Monday Night Football at a sold-out Ford Field. The Bears had Wednesday off. Is all the Lions' hype too much? Is the Lions’ hype teetering out of control? It’s a question being asked by the folks at ProFootballTalk.com. This week Calvin Johnson is on the cover of the national edition of Sports Illustrated and the hype will just continue to grow until kickoff of the Monday Night Football game against the Bears. If they win that one — they’re 6-point favorites — it will continue to blossom. It’s great for the fans and there’s no harm done to the team. It appears that between Jim Schwartz and the team leaders they will stay on message. They understand there is much to improve upon. They know they haven’t played their best football yet. And, don’t forget the biggest game is the next game. A little hype never hurt. 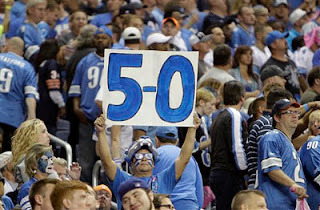 The city of Detroit and the devoted Lions’ fans deserve a little enjoyment for they undying support throughout the years. Since the Lions 34-30 win at Dallas was one of the most compelling NFL games on Sunday, perhaps it stands to reason it was high on the Twitter-ometer too. Based on fans’ tweets, the Lions’ come-from-behind win had the most excitement of all other games played last Sunday. The Detroit-Dallas game had 28 tweets a second on average for the whole game — more than nine times the total of the least-tweeted game. This isn’t just a guess this is done through research by Rice University and Motorola Mobility using SportSense, a computer program engineers created to analyze NFL fan tweets in real time. The least excitement was generated by the Tennessee Titans-Cleveland Browns and Miami Dolphins-San Diego Chargers games. If you’re not on Twitter or don’t follow games on Twitter give it a shot. It adds a whole new dimension to game coverage. Follow me on Twitter @PaulaPasche. I tweet daily and throughout games each week. ALLEN PARK — Well, well what do you know. Cris Carter has now backtracked on his comments about Lions wide receiver Calvin Johnson. Two months ago Carter named six NFL receivers he claimed were better than Johnson. Johnson grabbed a pair of touchdown catches in Sunday’s 34-30 win over the Cowboys to tie Carter’s record of scoring two touchdowns in four straight games. On Monday, Carter changed his mind. “Right now, Calvin Johnson — there’s a king in every crowd, and he’s the king of the National Football League as far as wide receivers,” Carter said on ESPN Radio via ProFootballTalk.com. Now, has anyone heard from Rob Ryan? 1. The Lions are resilient. Last week at Minnesota they were down 20-0 at the half and came back to win in overtime. It was quite the effort, but nothing compared to Sunday when they were down 27-3 in the third quarter. Their mantra in such situations is just make a play, then make another. And then they are confident enough to go out and do it. Unbelievable. 2. Depth helps. Linebacker Justin Durant, who led the team in tackles the first three games, was out with a concussion. In stepped Bobby Carpenter who made the first big play of the game. Same thing in the secondary when Amari Spievey and Erik Coleman missed time with injuries. With the heavy rotation on the defensive line they were able to stay somewhat fresh even though they were on the field for 12-plus minutes in the third quarter. 3. Matthew Stafford is all that. He and the offense struggled in the first half, but his teammates said he remained calm, cool and collected. They take on his personality on the field, so maintaining his cool is essential. One cool cat. 4. Calvin Johnson doesn’t need to say anything to Cris Carter or Rob Ryan, he just lets his play do his talking. We’re only four games in and I’m running out of adjectives to describe the big guy. 5. These Lions are for real. Period. ARLINGTON, Texas — No surprises among Lions inactives for today’s game against Cowboys. CB Aaron Berry, who was questionable with groin, is out. Alphonso Smith is active for the first time this season. All the others listed as questionable on Friday’s report are active including Amari Spievey (toe), Eric Wright (groin), Maurice Stovall (hand), John Wendling (knee) and Lawrence Jackson (hamstring). Other inactives are Justin Durant (concussion), Nick Fairley (foot), Jason Fox (foot), Rashied Davis (foot), Drew Stanton and Jacques McClendon. For Dallas, WR Miles Austin is out, Kevin Ogletree will start in his place. Others out for Cowboys are David Buehler, Tony Flammetta, Orlando Scandrick, David Arkin, Derrik Dockery and Jason Hatcher. Marcus Spears will start for Hatcher. 1. Contain linebacker DeMarcus Ware. The Lions did a good job containing him last year when they lost 35-19. He’s got five sacks in the first three games. Stafford was sacked five times last week so there’s no doubt the offensive line has been working on protecting the franchise this week. 2. Run the ball. The Lions have had some trouble in this area, they already miss Mikel Leshoure. It could get tougher against the Cowboys who excel at stopping the run. However, in Minnesota they used short passes to Brandon Pettigrew to take the place of the run game. That might work again. 3. Get the ball to Calvin. Don’t think this will be an issue. Calvin Johnson and Matthew Stafford have connected for a pair of touchdowns in each of the first three games. Stafford is a little angry about Cris Carter’s lack of respect for Johnson so he might try to find him even more often. 4. Get to Tony Romo early. Romo is still hurting with a broken rib and while Ndamukong Suh said it’s not his style to target an opponent’s injured area, suspiciously Suh knows it’s on his right side. But seriously if Suh lands on any part of Romo’s body there will be pain. It’s always the goal to rattle the quarterback early and this is no different. 5. Maintain attitude. While the Lions have become national media darlings — heck it was just two years ago they were 2-14 — they know that all they’ve done is win three games. They have to maintain that hunger and at the same time play with confidence. They’ve done it for three games. If they keep their eyes off the Dallas Cowboy cheerleaders (just kidding) there’s no reason they can’t do it again.